Flavors include gourmet chocolate, gourmet vanilla, cookies and cream, smooth banana and gourmet pina colada among others. 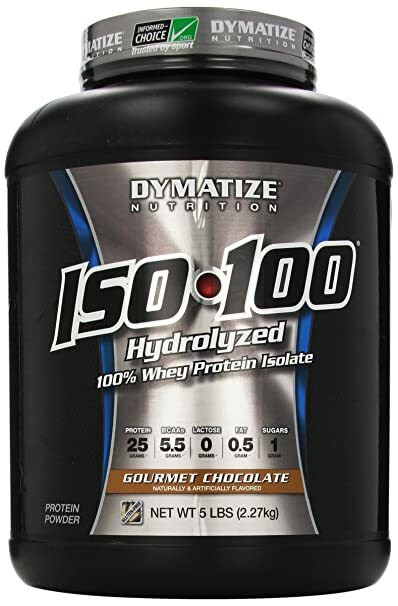 Dymatize is offering up some serious value with this product, and it can be found on Amazon for $74.99 in a five pound size, $46.44 for three pounds, or $29.16 for one pound. Consumers would be wise to purchase the five pound tub or three pound container since they offer greater value compared to the one pound option. Anyone that is serious about getting the maximum results from their whey protein while putting on maximum lean muscle should give ISO-100 strong consideration. To say that this product is nutrient dense is selling it far too short. This protein powder is one of the most feature packed proteins on the market. Of course, when talking about this product, the discussion has to begin with its 100 percent hydrolyzed whey protein. By providing 25 grams per serving of the fastest absorbing kind of protein known to man, this powder is going to seriously help weightlifters pack on muscle. For the purists, they can rest easy knowing that the protein in this product is used with chemically advanced cold-filtering processes which ensure important whey components such as lactoferrin and immunoglobins are not lost in the manufacturing process like most other proteins. All of this is to simply say that Dymatize has absolutely nailed it in regards to this powder’s protein profile. The advantages of this protein powder do not begin and end with just its protein. Dymatize has upped their game by improving the taste of their protein powder over past iterations of their products. Dymatize put their in-house flavor specialists to work on creating a shake that will feel like a reward, not merely a nutritious necessity. From their diligence, Dymatize has made its most delicious protein powder yet. Still, this taste would get dampened if the product clumped and did not mix efficiently. Fortunately, Dymatize doesn’t run into any such issues with this product. The powder will mix almost effortlessly to ensure a smooth and delicious consistency every time. Another standout feature of this powder is its branch chain amino acid profile. With over 5.5 grams of BCAAs per serving, athletes know that they are getting the nutrients they need to refuel after an intense workout. This powder also works to trim the fat found in other products in a very literal sense. With a mere one gram of fat and one gram of sugar per serving, this protein powder makes it all about the protein. Finally, this product is gluten and lactose free which makes it easy for athletes concerned about the negative health effects of these products to buy ISO-100 with a clear conscience. From the big picture all the way down to the little details that make big differences, Dymatize is a winner. It is almost difficult to even suggest that there are negatives associated with this product since it is such an industry leader that is known for its quality. As a result, this section is really going to be about minor nitpicking at worst. First, it is fairly obvious that the product is not cheap. At $74.99 for five pounds, there are certainly cheaper proteins to be found on the market. However, it has to be noted that they are cheaper for a reason. Their protein contents are inferior, their nutrition profiles are weaker and they frankly will not deliver similar results. Yet, it still has to be noted that this product is an investment. However, serious athletes that choose ISO-100 will not regret supplementing with this protein powder. Finally, some of the powders taste better than others. It has been suggested that the pina colada flavor is an acquired taste. This flavor is probably best avoided for athletes that like to keep their protein powder tasty and simple. Again, though, these are minor nitpicks at best and not truly disadvantages in the fullest sense of the word. Taken as a whole, this product delivers on everything a top of the line protein powder needs to deliver on. This protein powder sets out to deliver the fastest absorbing protein powder in a compelling and feature-rich package. On this front, Dymatize earns strong marks across the board. With 25 grams of hydrolyzed whey protein, 5.5 grams of BCAAs and a single gram of fat and carbohydrates per serving, it is difficult to suggest something Dymatize should do differently with this powder. While there are cheaper protein powders such as Optimum’s generally excellent Gold Standard powder, those powders are going to offer protein blends of whey concentrate and slower acting whey isolate. To reiterate, this product is not cheap but it is worth the price serious athletes will pay for it. In fact, it is worth a lot more than it is running for currently on Amazon. A five pound container typically sells around $140 and it is on sale for $78.49 on Amazon currently. In other words, there really is no better time for serious athletes to pick up this revolutionary protein powder.